Our history is woven into our hairstyles. 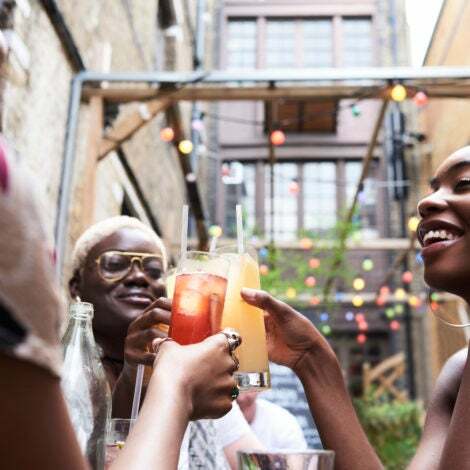 Here natural hair specialist Tamara Albertini, founder of New York City’s Ancestral Strands, looks back at the roots of our braids and updates them with a thoroughly modern twist. 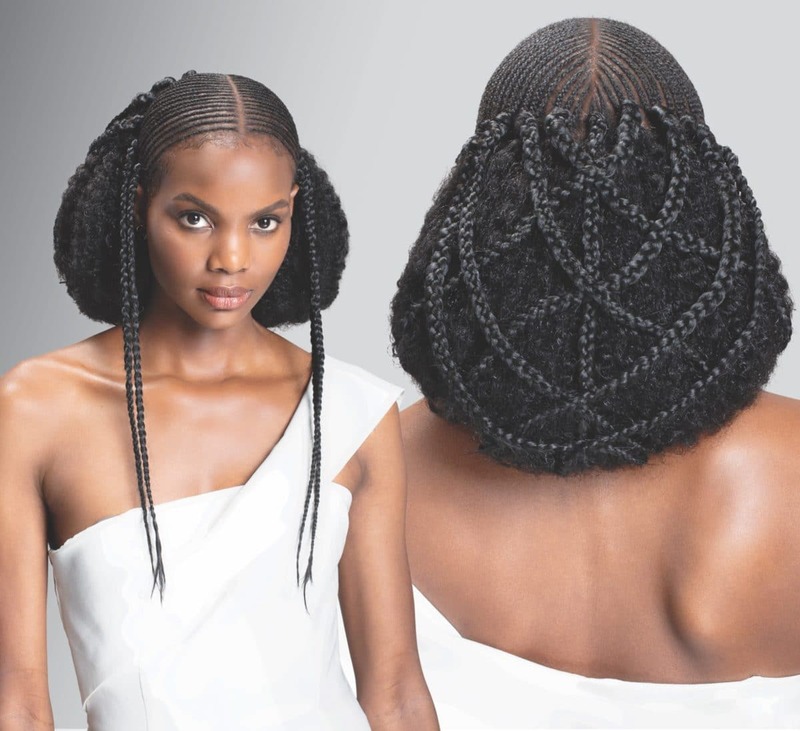 Here, her regal design starts with five Zulu knots, created by twisting the hair and wrapping it around itself to form cylindrical-shaped buns secured with hairpins. 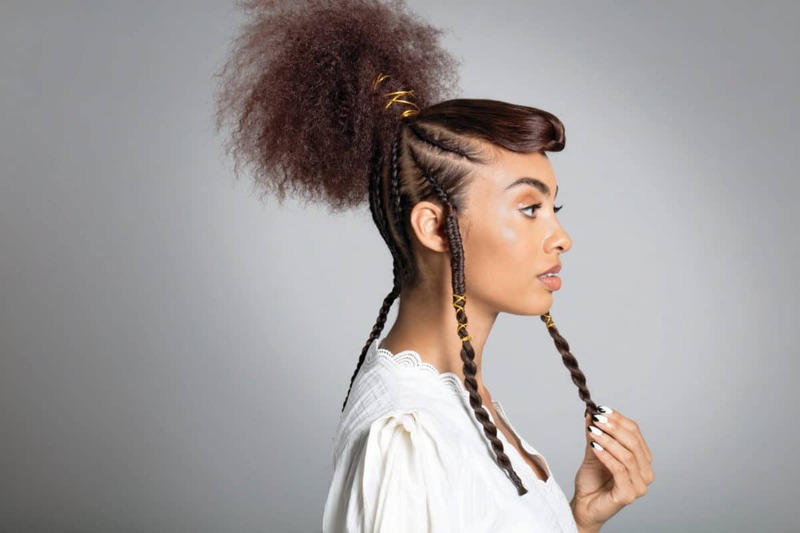 Each cluster is accented by two Tigray-inspired plaits that crisscross the forehead, almost like jewelry, while a half mane of natural hair is left out in the back. Albaso braids, once worn by the Habesha women in ancient Ethiopia, alternate thick and thin cornrows. This style is the inspiration for stitch braids. Popular in the U.S., they feature meticulously crafted parts between the thicker braids and produce a zipperlike look. Above, Albertini used precise curved parts to section the hair into five thick cornrows with four smaller ones running in between them. The result? Architectural elegance. 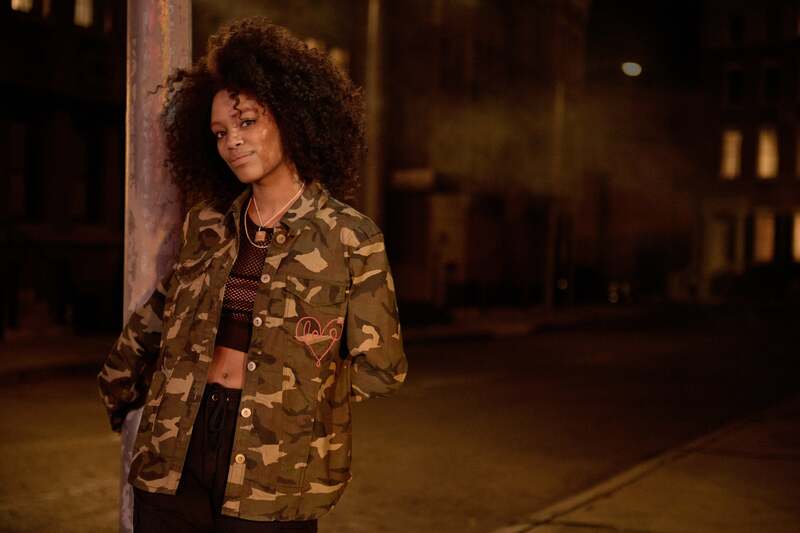 “We’re not making new styles – they already exist,” Albertini says. For example, she traces the method of braiding an individual center cornrow to the back of the head to techniques used by Ethiopians. 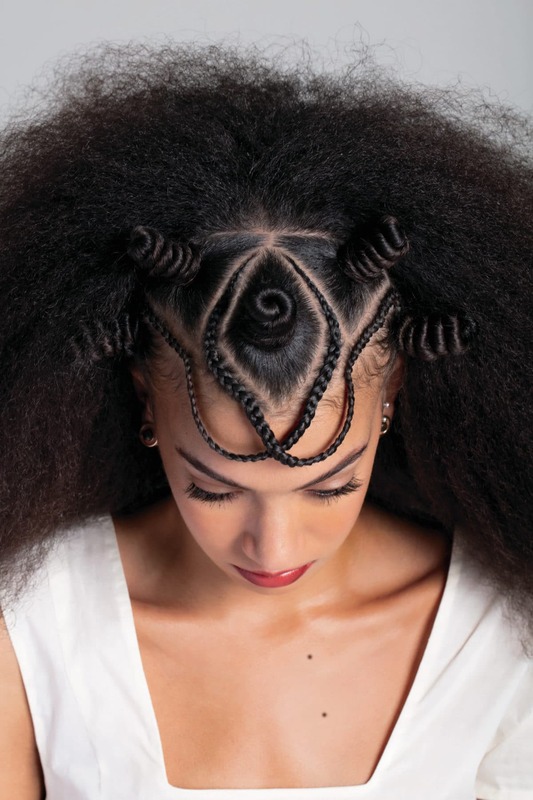 To reinterpret this look with a trendy take on texture, Albertini integrated a variety of Ethiopian techniques. 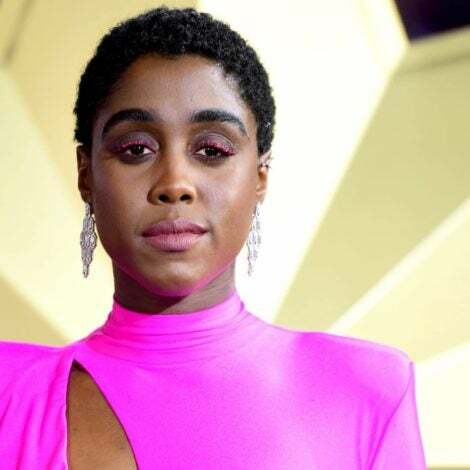 For the front pouf, she parted the hair, brushed it forward, braided it loosely (starting halfway down), tucked it around to create a pouf, and then folded it underneath before securing it with hairpins. 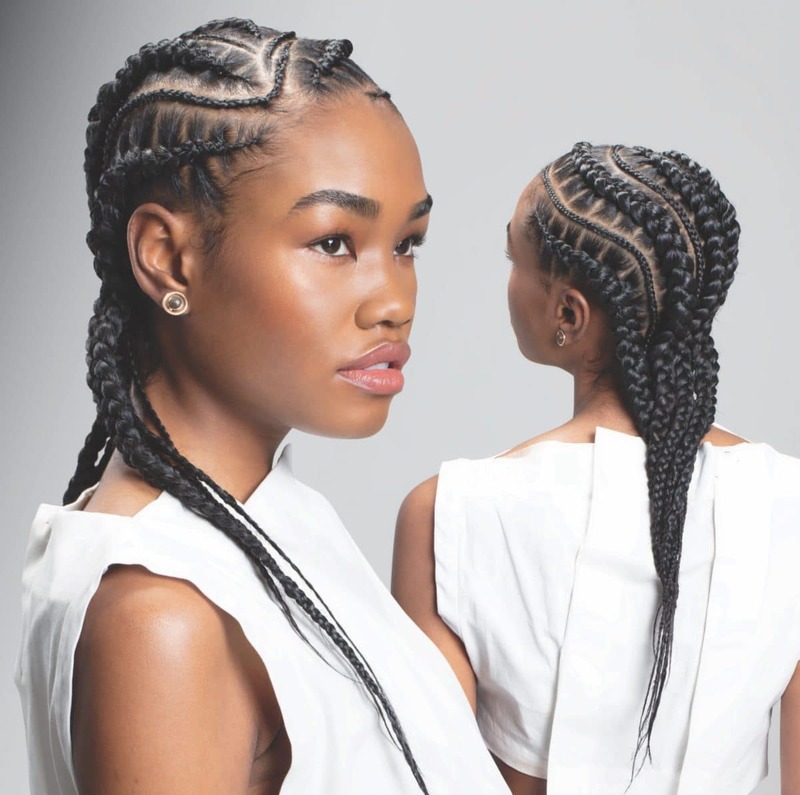 For the side braids, she started with a cornrow from the part to the hairline and then transitioned the cornrows into fishtail braids and finally into two-strand twists. At the back of the head, Fulani-style cornrows were braided up, leaving the ends out to form an Afro puff wrapped with gold thread. Last, a single cornrow was braided from the crown straight down the back. Traditional braids are not usually an assignment given to a stranger. Rather the task is considered an intimate undertaking performed by trusted family members or specialists. 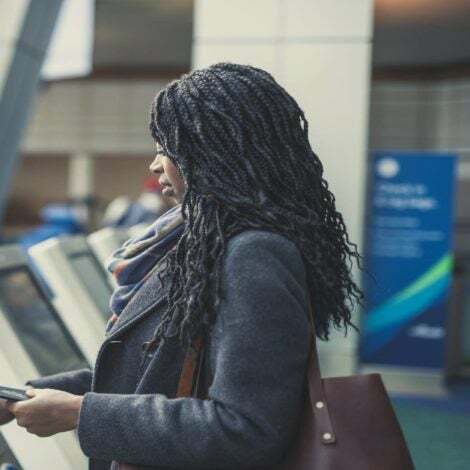 Gilbich braids – sported by the Tigrayans of Eritrea and Ethiopia as well as the Amhara people of Ethiopia – require an expereinced hand. The cornrows, which run to the sides or back, are extremely small and so intricate that they are often considered works of art. For an updated interpretation, Albertini plaited 15 to 17 fine braids on each side of a center part from the hairline to the crown. 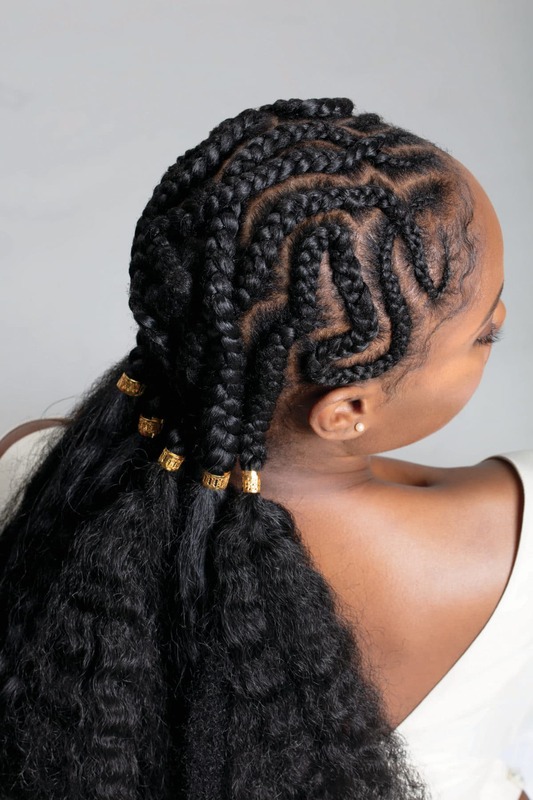 Then she added a dozen individual braids across the center back of the style and then crisscrossed them over the Afro at the back of the head. Afterwards she made a dozen individual box braids from the sides and crown and weaved them around the pouf. The spirit of our culture traveled with us across the Atlantic, embedding itself in our hearts and souls. Albertini believes that those memories are still in our DNA: “That’s why our connection to braids continued wherever our people were taken in the diaspora.” One such place is Colombia, where the beauty and culture of our natural hairstyles are celebrated every spring at the Tejiendo Esperanza (Knitting Hope) contest in the city of Cali. The slaves in both North and South America used map braids to record the route to freedom.”I let the spirit lead me to create this pattern,” Albertini says of her spin, which is a freestyle design with eight overlapping braids. The back is secured with hairpins and gold cuffs.